If you manage a small or large sales team, then you can definitely benefit from the Sales Management Sheet. This free template document has all the right tools to help you in your endeavor and get you started on the right path to map out your sales strategies, organize your clients, and create a functioning system in which to organize your sales team as well. This free template is everything that you need to finally get your sales in order and increase revenue with highly detailed accounts and strategies at your disposal. To get started, just follow the instruction given below. To download the template file to your computer, just click the link at the bottom of this page. Now, start in the setup page of the document and go through the information listed in each column and enter the current date at the top of your screen. This page helps you list the stages of your sale strategies, the status of certain sales, the lead sources you have to help you, client size/relevance, and the type of business your clients have. You also have an employee list that tracks names, departments, positions, and dates of employment/ resignation. The client list tab gives you exactly what you need to know about each client, including the sale value, salesman on the job, contact information, and much more on the client summary page as well. In the “Sales” tabs you see in the next few tabs, you will be able to keep track of multiple clients at the same time. If you have clients in the same business, area, or part of the same parent company, you can group them here. You can also use these pages to group clients by the salesman you have working with them. 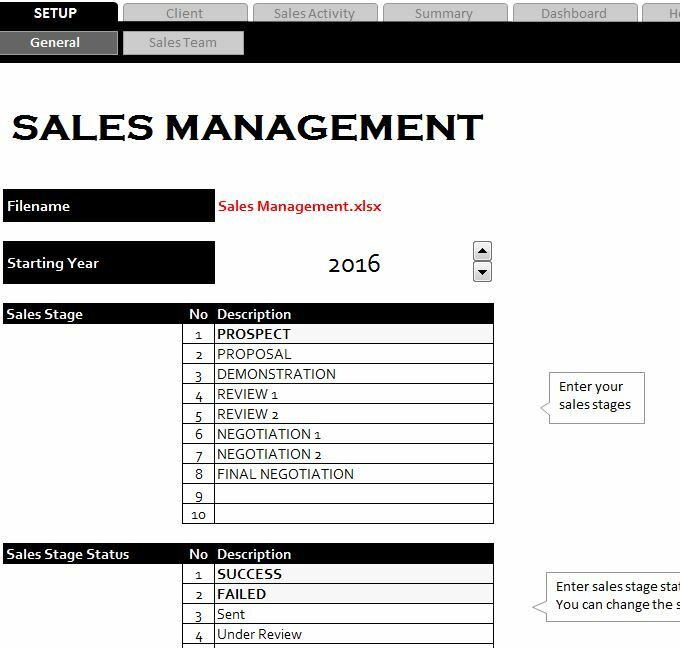 This Sales Management Sheet makes organizing client and employee information for a sales business easy.